It's time to scrutinise TfL's latest splurge of passenger data for the Docklands Light Railway. Tube and bus totals they publish every year, but DLR usage has to be prised out of them via a Freedom of Information Request. Figures are for total entries and exits during the calendar year 2018. Bank is the most used DLR station, which is good going for two cramped platforms shoehorned under the City of London. Tower Gateway is 14th, for comparison. In second place is Canning Town, the railhead where passengers on the Beckton and Woolwich branches switch to the Jubilee line. 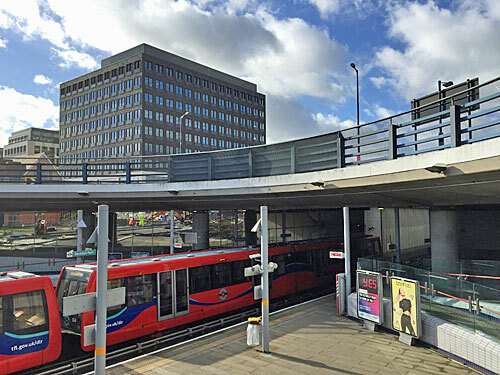 Three-quarters of Canning Town's DLR passengers use the high-level platforms, and one-quarter use the lowly satellite. Stratford is in third place, having crept decisively ahead of Canary Wharf over the last five years. Back in 2013 passenger usage at Stratford's two sets of DLR platforms was evenly split, but the lower platforms are now two million ahead. 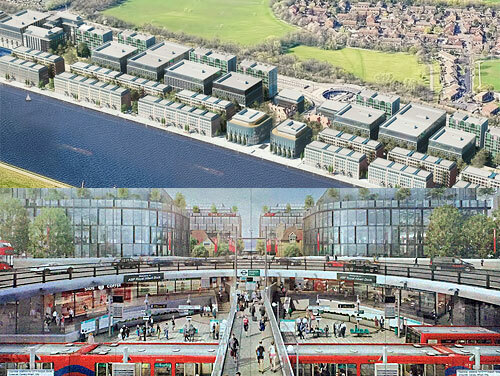 Woolwich Arsenal and Lewisham's high rankings confirm the popularity of cross-river connections. The other far-flung terminus, Beckton, barely scrapes the Top 30. Shadwell, Heron Quays and Limehouse are very close in terms of ridership, so don't read too much into their relative positions. Cutty Sark is the highest ranked DLR station not to interchange with any other railway line. 2018's Top 10 is exactly the same as five years ago, just in a different order. Since 2013 the biggest increase in passengers has been at Stratford International, thanks to the East Village growing up nearby. Beckton Park, three stops before Beckton, remains the least used DLR station. Every London tube station is busier. Pudding Mill Lane is the other DLR station with fewer than a million passengers annually (despite having been rebuilt as the largest station on the network). Abbey Road, Stratford High Street and Star Lane are all on the Stratford International branch, bypassed by the Jubilee line, and not especially busy. Most of the least used stations are on the fringes of Newham - none are south of the river. Back in 2013 Pontoon Dock was the 4th least-used station, but it's now well outside this Top 10 thanks to the development of dense new housing alongside. There's are good reasons why Beckton Park is the least used DLR station, including that it's not quite near enough to Beckton and too close to a park. The park stretches down to the next station, Royal Albert, and cuts off most of the nearest housing in Beckton proper. Only a few residential cul-de-sacs extend along the road to the east, towards Cyprus, so the catchment area isn't particularly large. Strait Road, the only connecting street, is the very definition of bleak, with several signs apologising for pavement subsidence. It's not an ideal spot to walk to after dark. Beckton Park and Cyprus are very similar stations in terms of design, each constructed within a roundabout on the elevated Royal Albert Way. A footbridge spans the platforms, which are semi-circular and feel like stepping down into a bowl. What's peculiar is that neither of these roundabouts are linked up to any other roads, and no connection has been made between road and station levels. Bright blue signs announce the name of the station to passing drivers, but there is no way to get down there, nor any place to stop. At least Cyprus station is connected to the University of East London's Docklands Campus, the one with pepperpot student accommodation. At Beckton Park the entire southern side of the station is completely cut off, there being no public access to half a mile of dockfront immediately adjacent to the station. That's because the industrial units which were previously here have been swept away in readiness for the construction of one of London's largest development sites, the one hardly anybody ever mentions - ABP Royal Albert Dock. The developers here are Chinese, their hope that a thin waterside strip the size of 35 football pitches will be transformed into a thriving international commercial hub with a particular emphasis on office space for Asian businesses. Two listed buildings have been retained - the Central Buffet and Dockmaster's Office - but everything else will be rigidly formulaic blocky offices, packed in tight for maximum profitability. Look across the water from City Airport over the the next few years and a monolithic wall of multi-storey uniformity will stare back. 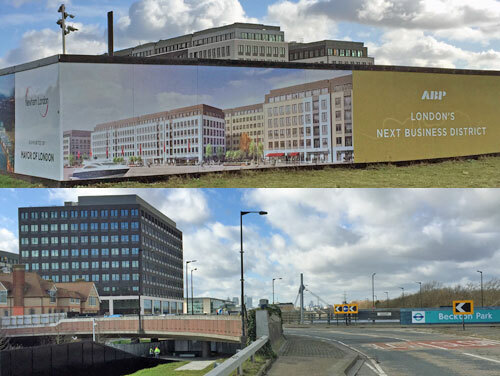 This may be a long-term project but the first buildings have already shot up along the waterfront closest to Beckton Park station, which will eventually become the gateway to this new commercial district. I accidentally walked out towards the worksite and found myself in a funnelled passageway liberally pasted with posters saying No Spitting Red Card Offense amid a stream of foreign workers who thankfully weren't doing that, and politely retreated. The hoardings around the development include an artist's impression of what the DLR station will look like when RAD is complete. The station swarms with smart folk in businesswear or sports attire. A ring of coffee shops and sushi bars has sprung up inside what are currently gloomy recesses, and a central promenade stretches off between glassy offices towards the dockside. One day Beckton Park station may be a thronging commercial hub fizzing with international possibility, and hugely busier... but until then it's bottom of the heap every year, guaranteed.